We are deeply alarmed by increasing risks that nuclear weapons will be used by intent, miscalculation or accident. The Singapore Summit is an encouraging sign that the dangerous US-North Korea confrontation will give way to a process leading to a peaceful and denuclearized Korean peninsula. Nonetheless, the danger of nuclear war in this new moment may be greater than at the height of the Cold War; it is surely more unpredictable. Global nuclear disarmament – not just preventing the spread of nuclear weapons – is imperative. This statement addresses the new US-Russian nuclear arms race; the North Korean situation; US actions in relation to the agreement and Security Council resolution regarding Iran’s nuclear program; and ongoing risks of accidents and miscalculations involving nuclear weapons. At the end, we recommend actions to be taken by IALANA affiliates and other civil society actors. 1) The US Nuclear Posture Review released 2 February 2018 moves the world toward nuclear inferno. It fails to propose any initiatives, bilateral or multilateral, for arms control and disarmament, and rejects US ratification of the Comprehensive Nuclear-Test-Ban Treaty. It proposes two new capabilities, a low-yield warhead deployed on submarine-launched missiles and a sea-based, nuclear-armed cruise missile, and carries forward the destabilizing replacement of the existing air-launched cruise missile with a stealthier, more capable version. The review also repeatedly refers to the role of nuclear weapons in responding to “non-nuclear strategic attacks”. Similarly alarming signals are coming from Russia. In a 1 March 2018 address, President Vladimir Putin described the development of an array of new nuclear weapons delivery systems, including a nuclear-powered cruise missile, an underwater drone carrying “massive nuclear ordinance”, and a multiple warhead ballistic missile with virtually unlimited range capable of flying over the South as well as the North Pole. 2) With the exchange of threats between North Korea and the United States in 2017, the world probably was the closest it has been to nuclear war since the Cuban Missile Crisis. The Singapore Summit and other moves in 2018 toward resolution of the crisis and achievement of peace and eventual denuclearization on the Korean Peninsula are therefore most welcome. To be sure, complacency is not at all warranted, as the maneuvering over the summit and its limited and vague results demonstrate. Nonetheless, that North Korea has refrained this year from testing nuclear explosives and missiles is a very positive step. Also noteworthy is the reaffirmation in the Panmunjom Declaration of the Non-Aggression Agreement precluding the use of force by North Korea and South Korea in any form against each other. 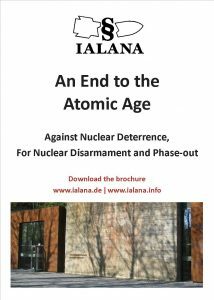 The US and North Korea must reach the same result, as IALANA called for in its statement of 10 October 2017. Progress is important not only for the paramount reason of avoiding war, which might very well become nuclear. It also is crucial for the purpose of preserving the non-proliferation regime and proceeding with global nuclear disarmament. We underline that the people and government of South Korea have taken a leading role in seeking a peaceful solution to the long confrontation on the Korean Peninsula that is at the root of the nuclear crisis there. The current South Korean government was brought to power by a powerful democracy movement, and continues to receive overwhelming public support for its peace initiatives. These actions show that a mobilized population can affect government policy at the highest level, and should be an inspiration for people everywhere. 3) The US declaration that it will no longer implement the Joint Common Plan of Action and will reimpose sanctions on Iran inconsistent with the JCPOA is a major blow to international governance and to peace and disarmament in the region and the world. The JCPOA, para. 28, provides that the parties to it “commit to implement this JCPOA in good faith and in a constructive atmosphere, based on mutual respect, and to refrain from any action inconsistent with the letter, spirit and intent of this JCPOA that would undermine its successful implementation.” A viable international order requires good-faith execution of agreements whether considered political or legal. Success in international cooperation is not possible if promises and representations cannot be relied upon. In para. 2, Resolution 2231 “calls upon” UN member states to take “actions commensurate with the JCPOA and this resolution” and to refrain from “actions that undermine implementation of commitments under the JCPOA.” Paragraph 26 “urges” all states “to cooperate fully with the Security Council in its exercise of the tasks related to this resolution.” Though the resolution does not label either paragraph a “decision” of the Security Council, in adopting them the Council without question was acting to fulfil its “primary responsibility for the maintenance of international peace and security” conferred by Article 24 of the UN Charter. In a 1971 advisory opinion, the International Court of Justice, taking into account “all circumstances”, held legally binding a provision of a Security Council resolution which provision “calls upon all States” to refrain from acts inconsistent with the Council’s determination that “the continued presence of the South African authorities in Namibia is illegal.” Similarly here, under all the circumstances, paras. 2 and 26 of Resolution 2231 are legally binding directives of the Security Council. The US is acting contrary to those directives, thereby undermining the effectiveness of the Security Council in addressing issues of nuclear non-proliferation and disarmament in Iran and generally. We suggest consideration of a UN General Assembly request for an International Court of Justice advisory opinion on the legal consequences of Resolution 2231 and the JCPOA. Such an opinion would provide important guidance, inter alia, regarding US sanctions imposed on non-US enterprises engaged in commercial dealings in Iran and with Iranian enterprises. The other parties to the JCPOA – Iran, United Kingdom, France, Russia, China, Germany, and European Union – must work to ensure the continued implementation of the agreement. And all nations and global civil society should make clear that US contravention of the JCPOA and Resolution 2231 is unacceptable and dangerous and must be reversed. 4) The existence and deployment of nuclear weapons pose intolerable dangers in the contexts mentioned above and in others as well, as in India-Pakistan and US-China relations. Moreover, the risks of accidents and miscalculations involving nuclear weapons are always with us, as was illustrated by the erroneous alert that nuclear missiles were incoming endured by Hawaiians in January 2018. Alarms determined to be false only minutes before a nuclear response might be triggered have occurred throughout the nuclear age and will continue to do so. One day our luck will run out. Urge their governments to sign and ratify the Treaty on the Prohibition of Nuclear Weapons. Hans Corell, former Under-Secretary-General for Legal Affairs and the Legal Counsel of the United Nations, has expressed the view to IALANA that both paras. 2 and 26 are legally binding on all UN member states. The German parliamentary research service reached the same conclusion regarding para. 2 in “Völkerrechtliche Bewertung der Aufkündigung des Iran-Nuklearabkommens durch die US-Administration,” Wissenschaftliche Dienste, Deutscher Bundestag, WD 2 – 3000 – 074/18, 2018.